It's the same Bomberman Live game that was released for XBLA, but now for PSN and with all the extra download packs included. The demo they had featured a few different selectable maps for anyone to come up and jump right into. There were Hudson staff on hand to help out anyone who was confused about why people were supposed to blow each other up. The game is done and comes out at the end of February. 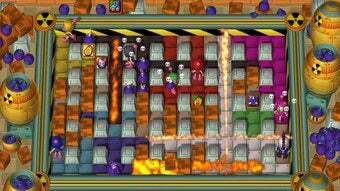 Well...: At this point in Bomberman's life cycle, it's hard to fine ways to make the game even better. Customization: The say you can customize your own Bomberman with over 150,000 possible combinations. I couldn't examine the extent of the customization at the demo, however. Pick-Up and Play Approach: The game is really easy to jump right into. I noticed several people, mainly kids, just come up and pick up a controller and get right into it. Uh, it's Bomerman. I can't say I've experienced the multiplayer before in a way that people would be jumping in and out. It was quite fun. I could see this maybe making an excellent party game just to have out.